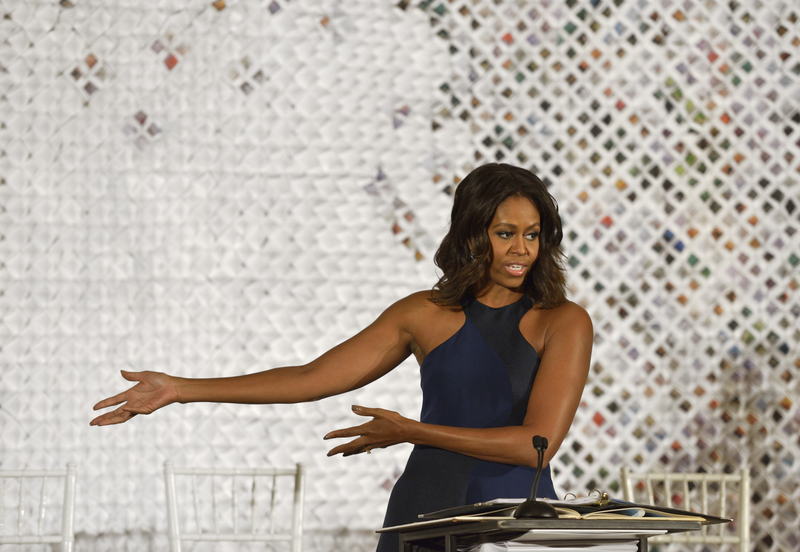 First Lady Michelle Obama stands before a re-purposed paper backdrop prepared by students form Parsons School of Constructed Environments in the White House’s historic East Room. Image: Martin Seck. On October 8, a delegation of 31 students, as well as distinguished alumni, faculty and leaders from The New School’s Parsons School of Design were on site at the White House by invitation from the First Lady to take part in the first ever White House Fashion Education Workshop. Sixteen Parsons undergraduate and graduate students secretly spent two weeks conceiving and building a striking installation in the White House East Room as the backdrop for the day’s events and announcements. As part of The product of a rapid two-week exploration, led by Alison Mears, Dean of the School of Design Strategies at Parsons, Jonsara Ruth, Director, MFA Interior Design at Parsons, and stylist Helen Quinn, faculty at the School of Constructed Environments, the White House East Room transformation features works by 16 Parsons students. In the spirit of Mrs. Obama’s, focus on education, the group repurposed 600 discarded books to create a celebratory and sustainable installation – including a stage backdrop made from 4,000 folded pages, centerpieces and mantelpieces made from folded books, sculptural columns made from books turned inside out and napkin rings/bracelets made from laser-cut book covers. An elegant, transparent lectern welded from discarded steel was designed to showcase the First Lady’s dress. Local flowers and ferns were used to make garlands that complement the sculptural paper pieces and the East Room.